Point Pleasant freshman Grace Teichman hits a forehand return during an April 11 match against Huntington Saint Joseph at The Courts in Point Pleasant, W.Va.
RAVENSWOOD, W.Va. — They went down fighting. 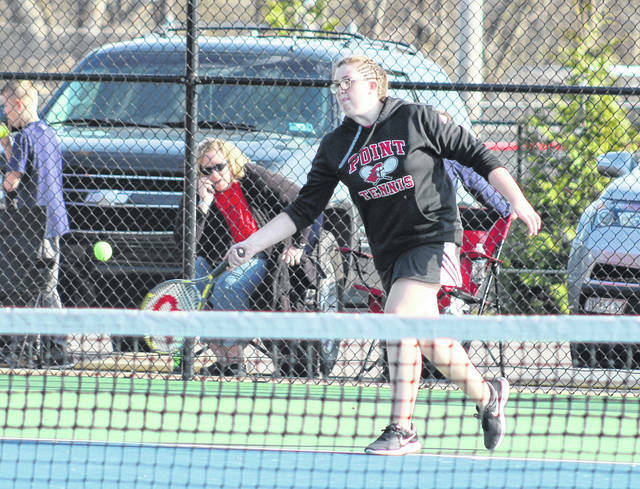 The Point Pleasant girls tennis team came very close to pulling off a road victory, but host Ravenswood ultimately came away with the prize on Thursday during a 4-3 decision in a non-conference match in Jackson County. The Lady Knights (9-5-1) won a pair of tiebreakers to secure two of their three wins, but the guests weren’t as fortunate in another pair of doubles contests that ended being decided by two games apiece. The Red Devilettes won both of those matches and also went .500 in singles competition, allowing the hosts to wrap up a hard-fought 4-3 triumph. Bailey Barnett won a 7-4 tiebreaker in second singles to secure a 9-8 victory over Molly McCutcheon, while Sarah Deem cruised to an 8-2 win over Kayla Liptrap in fourth singles. Olivia Pyles dropped an 8-3 decision to Jilliann Throneberry in first singles and Tana Phillips won 8-1 over Caroline Foreman in third singles. Pyles and Barnett suffered an 8-6 loss to McCutcheon and Phillips in first doubles, while Foreman and Deem dropped a 9-7 decision to Throneberry and Liptrap in second doubles. Olivia Martin and Grace Teichman needed a 7-5 tiebreaking win to secure a 9-8 decision over Chiara Iovine and Annabelle Alfred in third doubles. Point Pleasant will complete its regular season schedule on Tuesday when it travels to Gallia Academy. The Lady Knights begin tournament play Thursday at Logan High School.